Believe Dream Create with Maria: StencilGirl Test Drive...Jump for Joy! 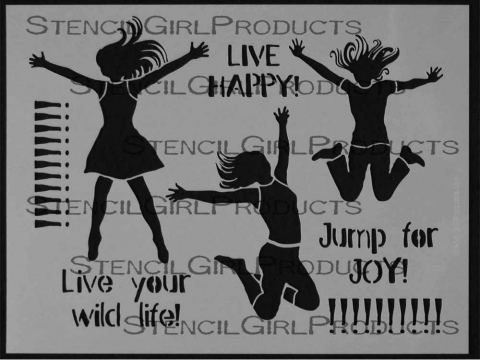 StencilGirl Test Drive...Jump for Joy! 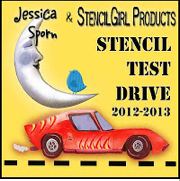 Welcome to another StencilGirl Test Drive with stencils designed by Jessica Sporn. Today we are test driving the Jump for Joy Stencil by Jessica. I don't know how you can't be in a good mood after using this stencil. Is is so HAPPY! I just love the silhouettes on it. I also love the sayings and the exclamation points which I think would make a fabulous border on a page (which I intend on doing). I actually had another idea for this stencil. When I flipped to a new page in my journal to start, I found that I had actually used up some of my left over molding paste that I had mixed in black with this stencil last week. One thing led to another and I kept playing on that page. 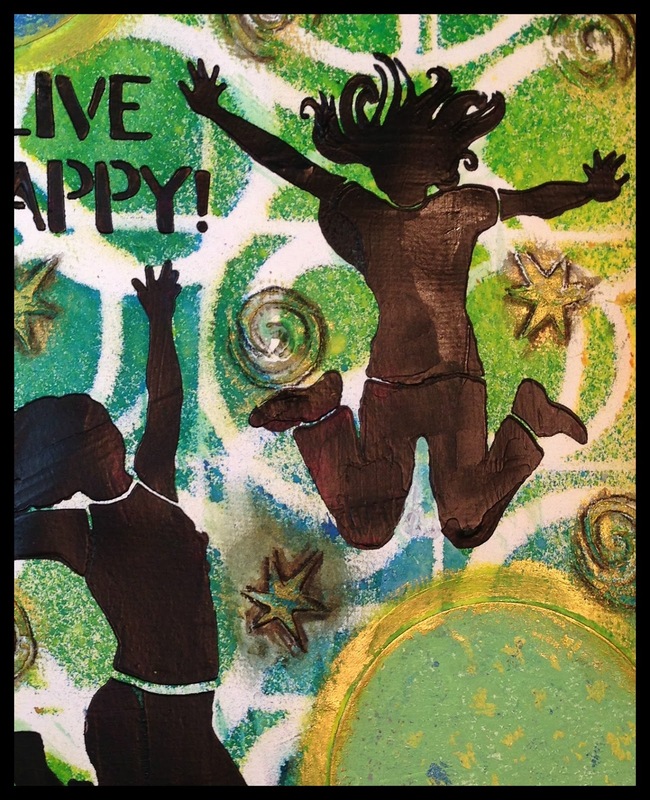 with spray ink and Starry Night by Jessica Sporn to do the swirls and stars with molding paste. From there I put some cirlces down that I cut from a sheet of paper I had printed on my Gelli Plate. It actually came together rather fast and I was happy with the outcome. Want some other ideas for this stencil?? It's time to go visit three other artists and see how they used this stencil. I love how you used the black to make them pop! I need to play with more modeling paste- thanks for the inspiration! So much joyous energy in this! Beautiful page Maria! I love how the black images stand out against the beautiful sprayed background!!! I agree with you about how happy this stencil is!!! That black? Wow.. jump is right. And the background.. great flow and colors. 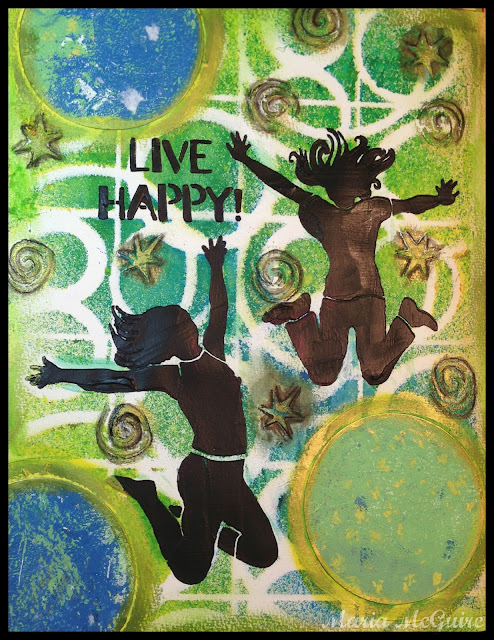 Love all the dimension and how you combined several stencils to create an awesome page! The background colors are beautiful too! really fabulous page Maria!! !Love the textures and how the silhouettes popp off the page! Love the combo! A gorgeous page and you're right, the words as a border would ROCK. The black ia a wonderful idea. What fun these girls are having!